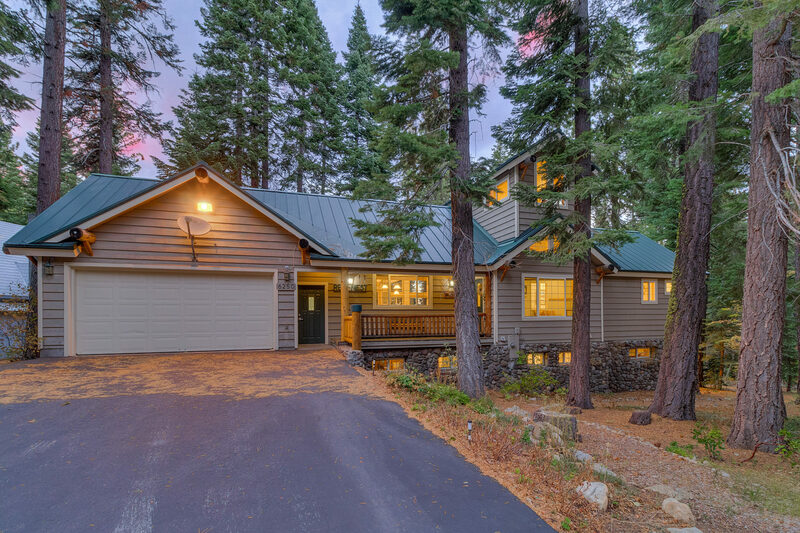 The Ref-Nest is located in the highly desirable neighborhood of Chambers Landing on the West Shore of Lake Tahoe, just past Homewood and Homewood Ski Resort. 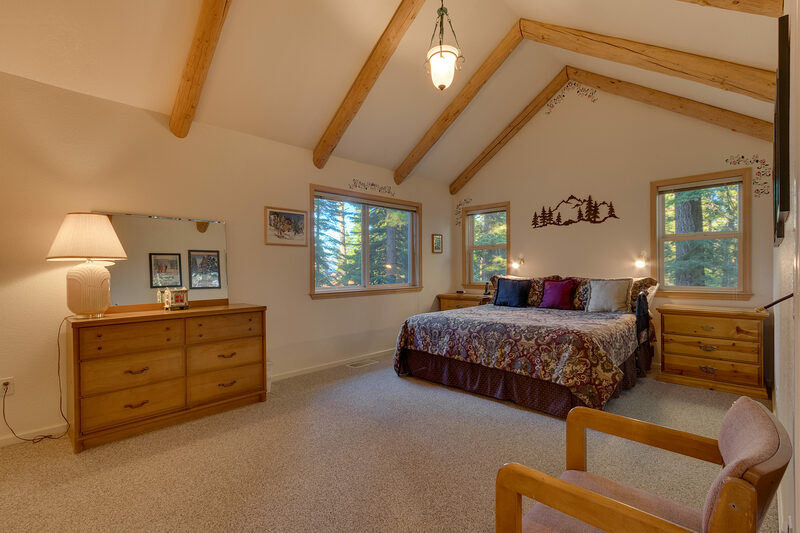 With six bedrooms and three bathrooms, this spacious, one of a kind home sleeps 16! 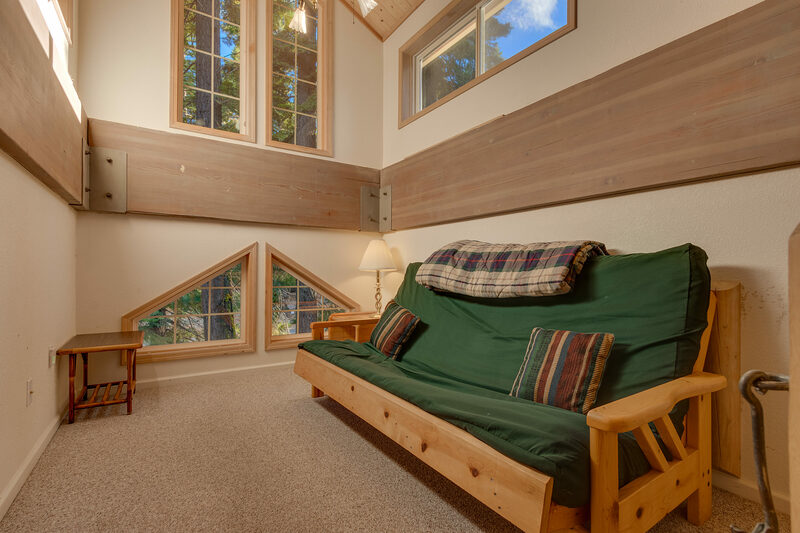 Custom built by owner/contractor, you’ll have 4000 square feet of space in this cabin, designed with large family gatherings in mind. 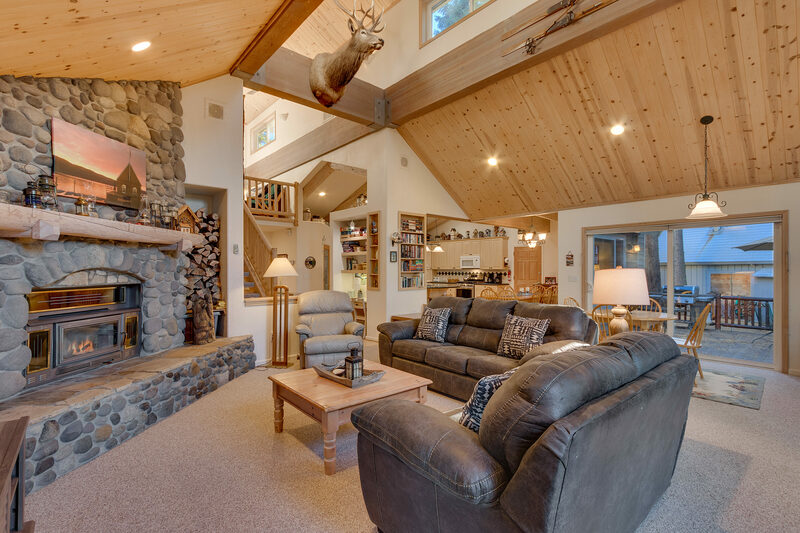 The expansive great room features a large river rock wood-burning fireplace, comfortable furnishings for TV viewing, reading, and table games. Wi-Fi keeps you connected. 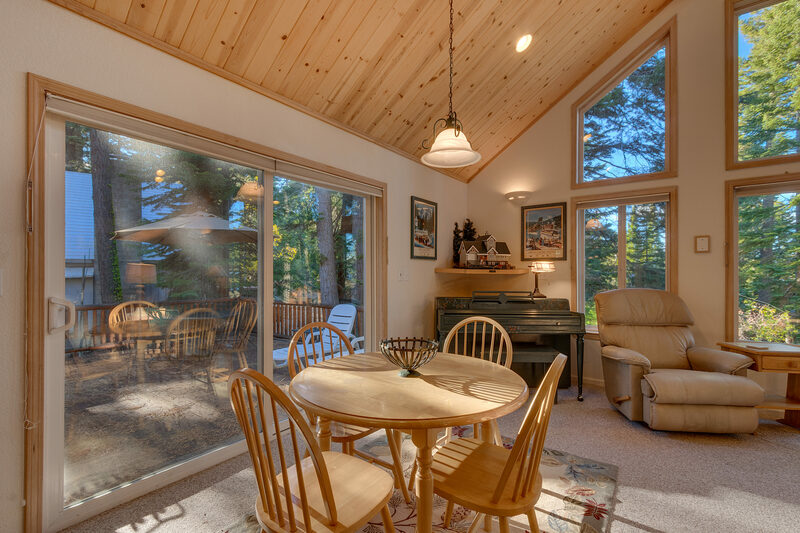 Off the great room, the outdoor deck features a gas grill and is a fantastic place for summer dining, bird watching, or sunbathing. 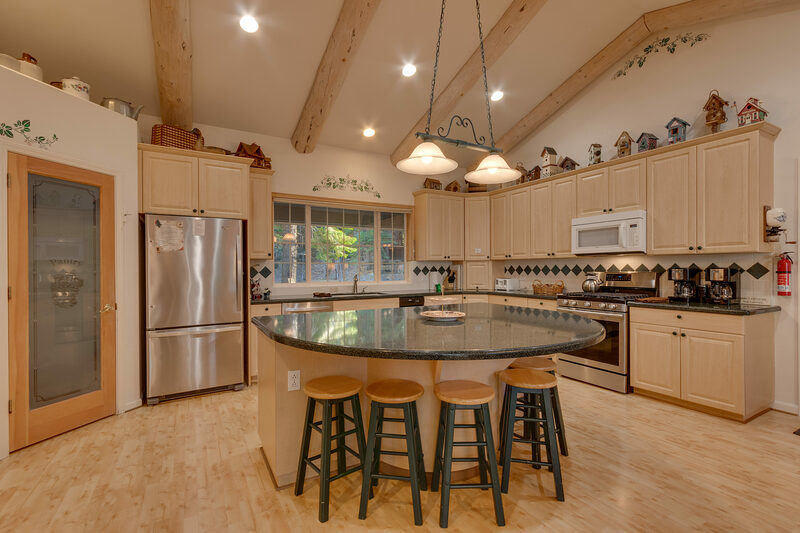 The fully equipped modern kitchen features a large island with granite countertops and seating for six, a dining table that accommodates ten, and abundant cabinet space including a pantry. 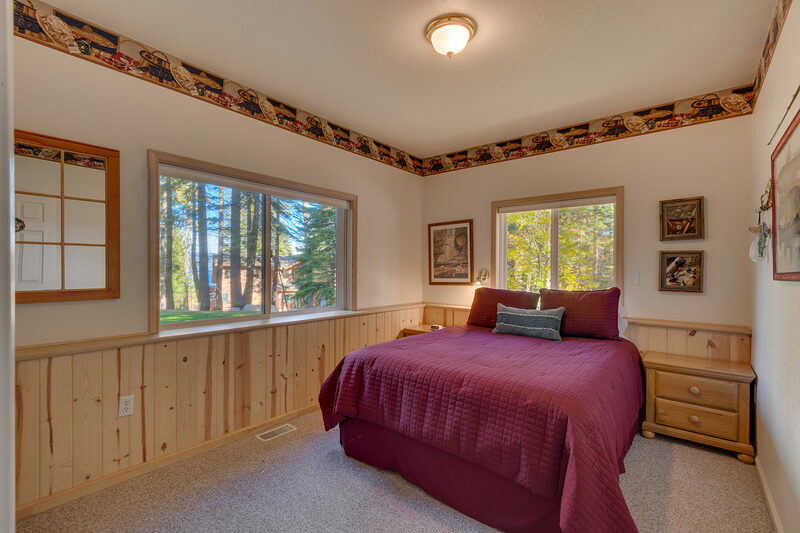 The master suite with king bed has plenty of room for additional young children and a full bathroom next door. 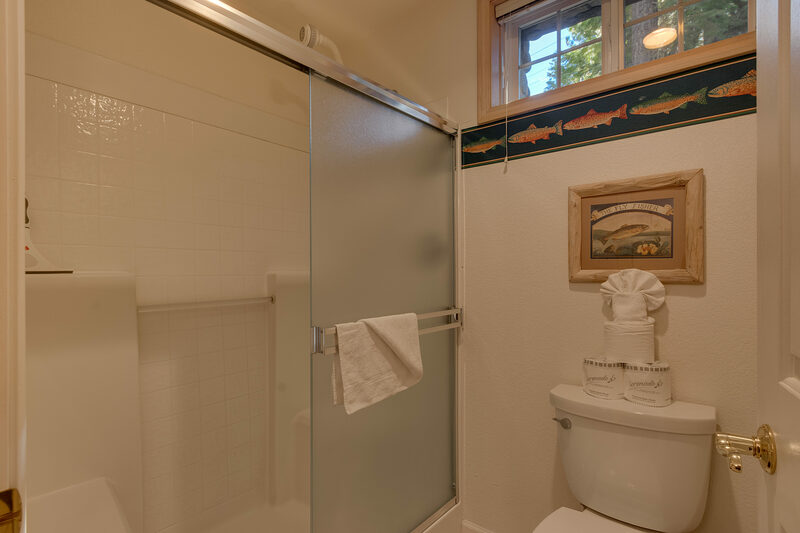 All the above are on the entry level of the home. 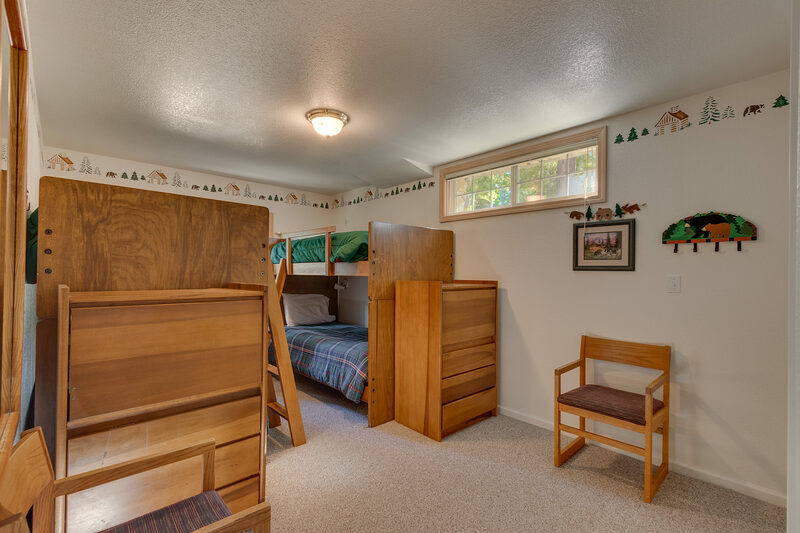 The downstairs includes five bedrooms: one king, two queen bedrooms, and two bunkrooms with four beds each. 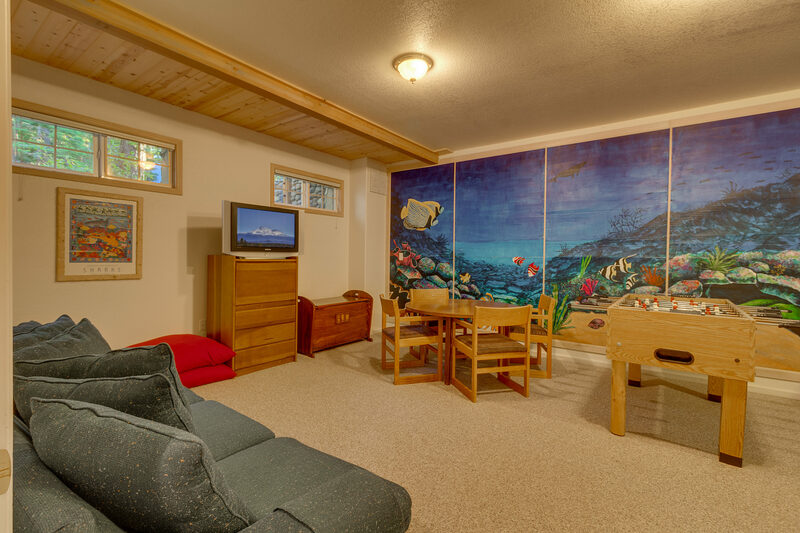 One bunkroom has a game area with TV and foosball. 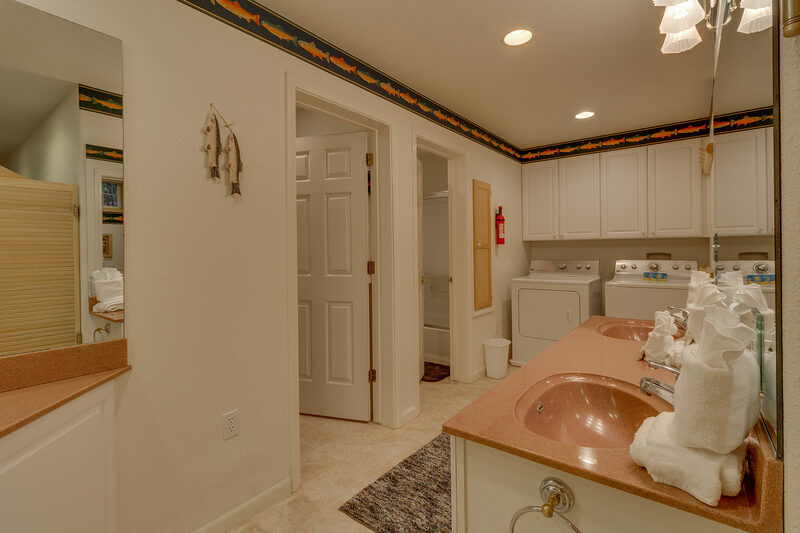 There are two full bathrooms, a common vanity with double sinks, and a washer and dryer. 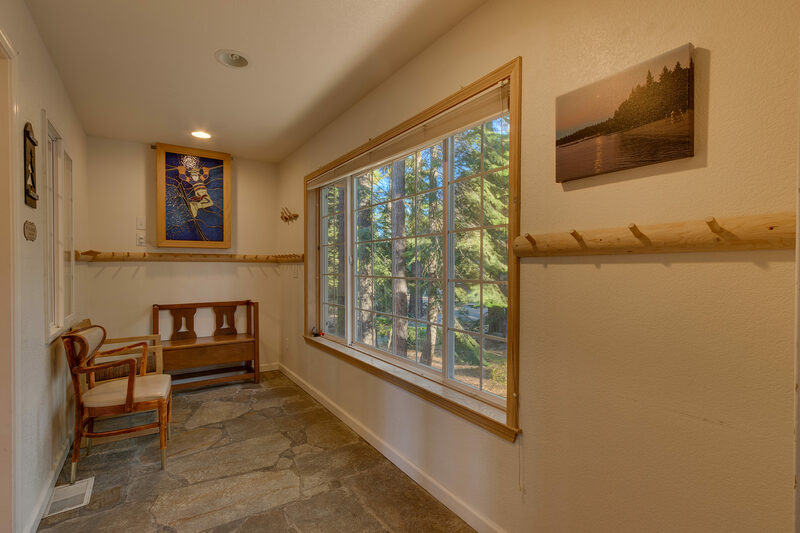 An exterior door leads to the beautifully landscaped backyard. In winter, the driveway accommodates four cars. In the summer, you may also park on the street and the side of the house. The garage is available when the ping-pong table is not in use. 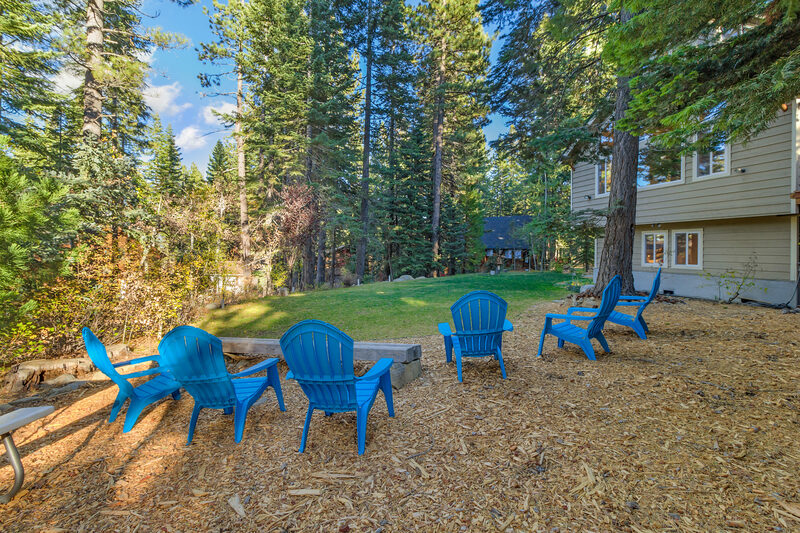 In summer months, the cabin is a short walk to our 'members only' private beach at Chambers Landing, known for its pristine views of Lake Tahoe. Visitors can also enjoy the public sandy beach and historic restaurant, bar, and pier at Chambers Landing. Transportation is made easy by catching a ride on the shuttle service. 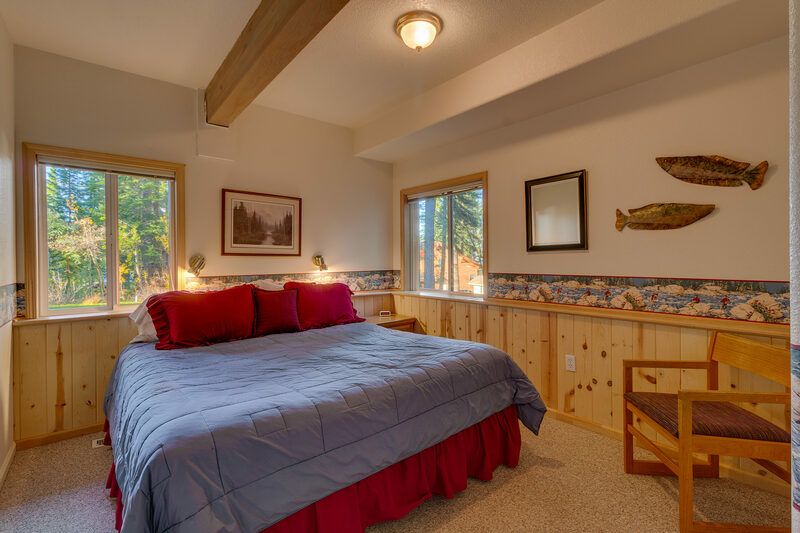 Your home away from home is close to Meeks Bay, with a terrific sandy beach and paddleboard and boat rentals. Located on National Forest Land, the Meeks Bay shoreline is popular for its beautiful scenery, clean beaches, and easy access. 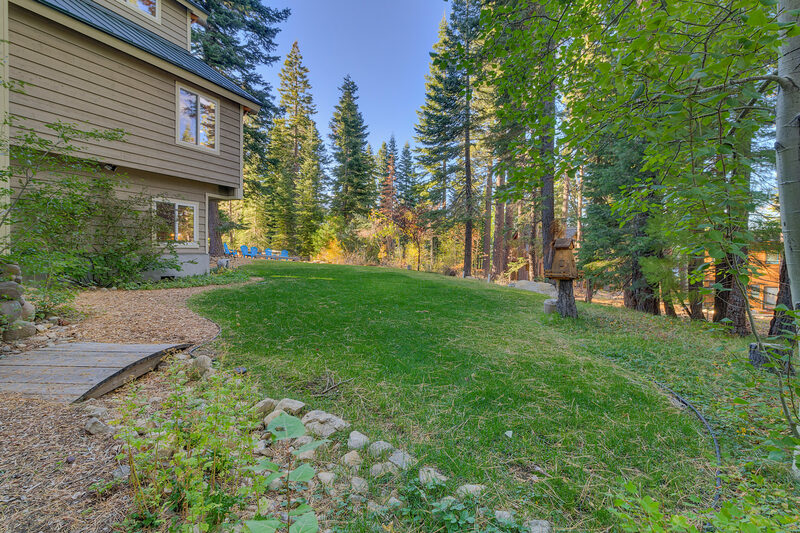 The area offers a high concentration of recreation opportunities including swimming, biking, boating and hiking into the nearby Desolation Wilderness. 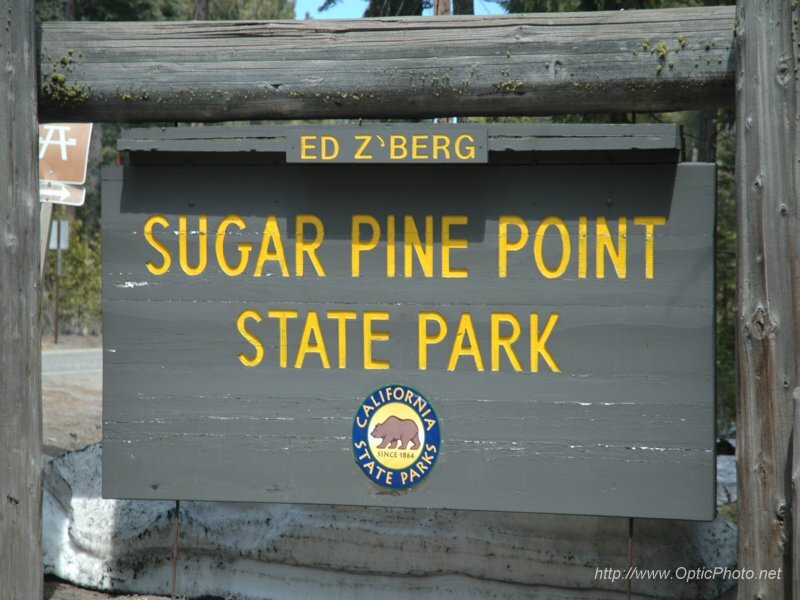 Ed Z’Berg – Sugar Pine Point State Park contains one of the finest remaining natural areas on Lake Tahoe. With nearly two miles of lake frontage, the park has dense forests of pine, fir, aspen, and juniper. Another attraction is the Hellman-Ehrman Mansion (also known as Pine Lodge), a summer home built in 1903. 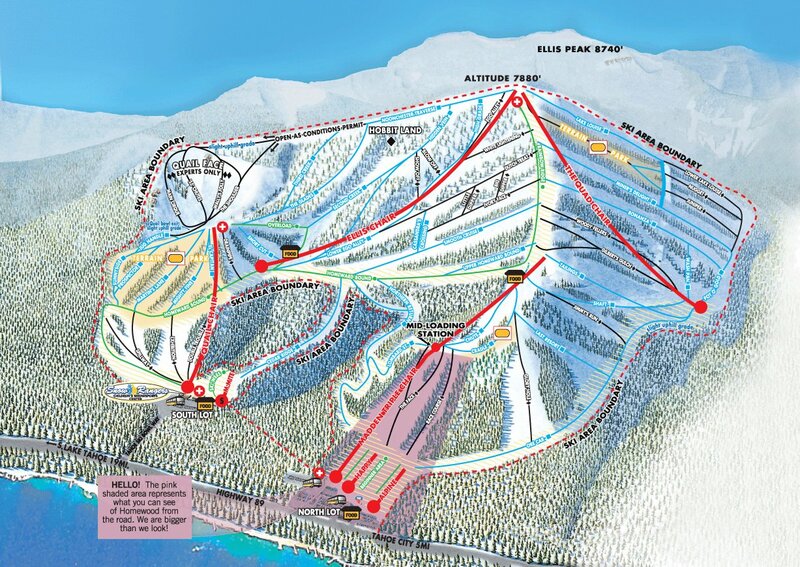 Winter visitors to the park will find over 20 kilometers of marked cross country ski trails and a heated restroom in the General Creek campground. D.L. Bliss State Park is open to vehicular traffic in the summer, where you can enjoy swimming or scuba diving in the crystal clear water of Lake Tahoe, picnicking, relaxing on the warm sand of Lester Beach or Calawee Cove, and access to hiking the Rubicon Trail, Lighthouse Trail, and Balancing Rock Trail. 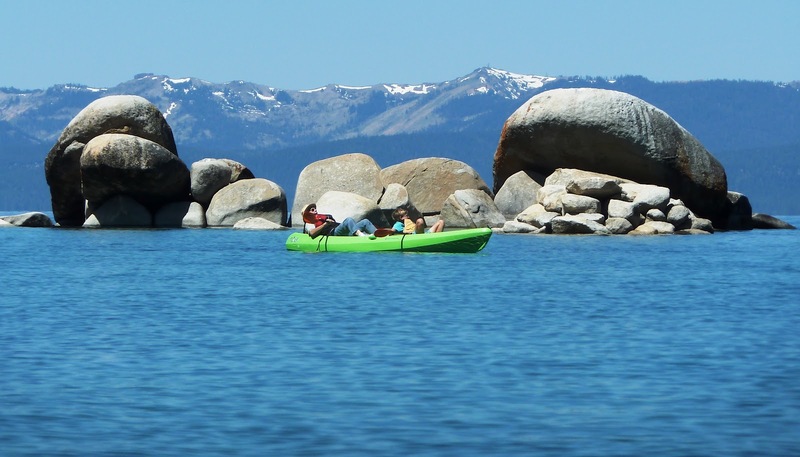 Lester Beach is a popular location to launch your kayak, paddleboard, or canoe. 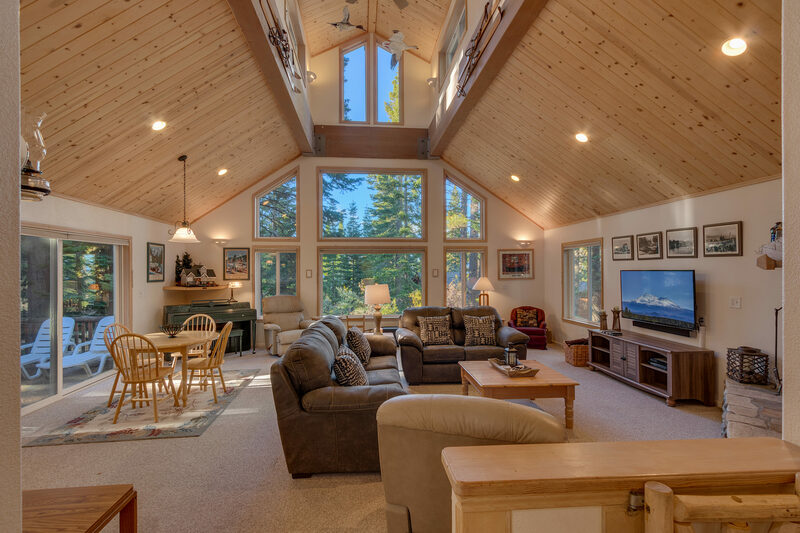 You won’t want to miss the icon of Lake Tahoe, Emerald Bay, a short drive away. 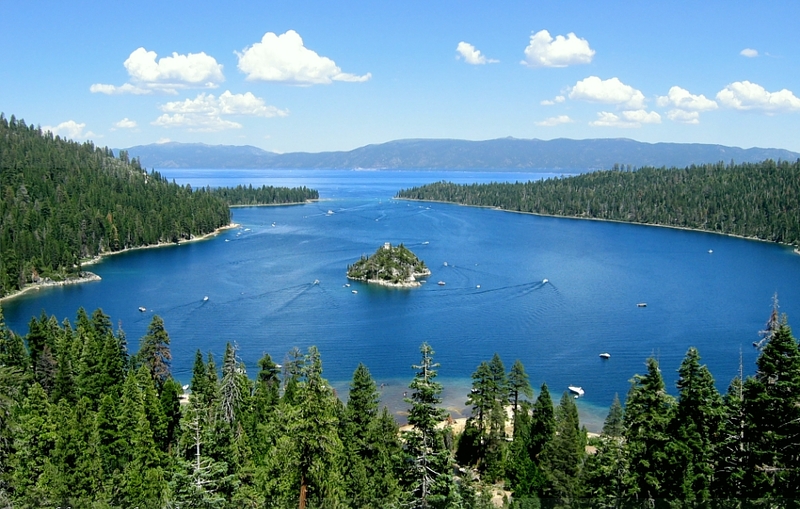 Emerald Bay State Park boasts 360-degree picturesque views that encompass Emerald Bay, Fannette Island, Eagle Falls, and Vikingsholm Castle. 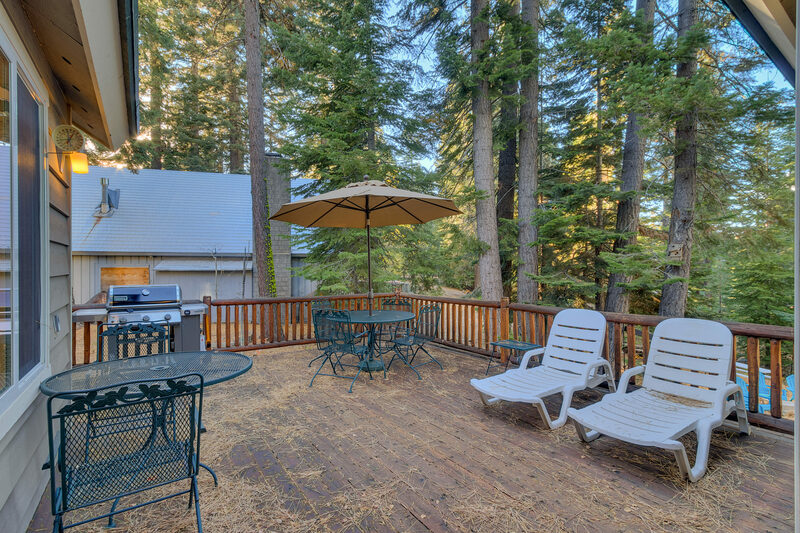 Just a few miles down the road you’ll find Homewood, Alpine Meadows, and Squaw Valley Ski Resorts. The Magical West Shore has great options for whatever you fancy: snowshoeing, snowboarding, downhill or cross-country skiing, sledding, and more! Interested dining options? We recommend the Fire Sign Cafe for breakfast and lunch. The local market is convenient for a quick stop and West Shore Pizza is sure to please. 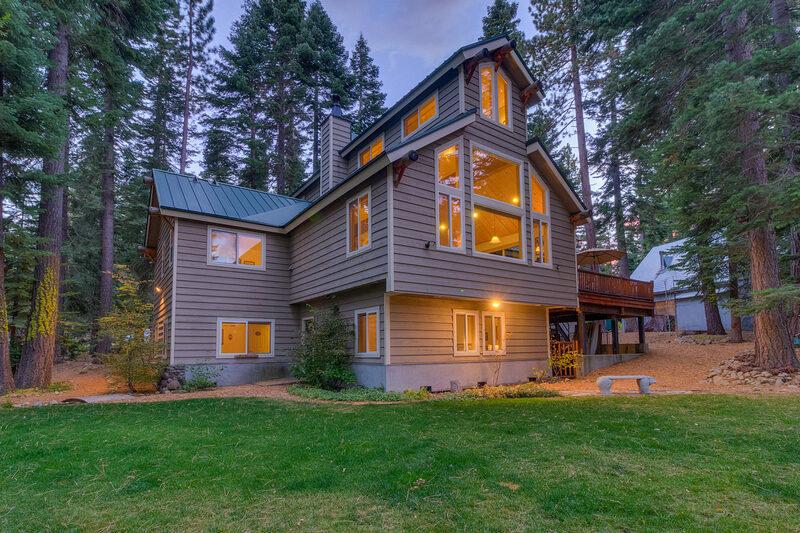 To experience all the gambling and nightlife that the Lake Tahoe offers, South Lake Tahoe/Stateline is about a 30-minute drive. 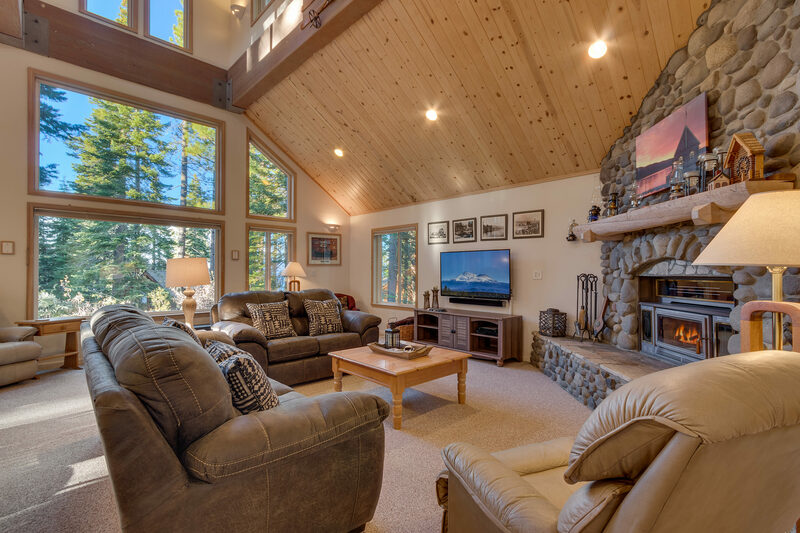 This property worked great for our group. 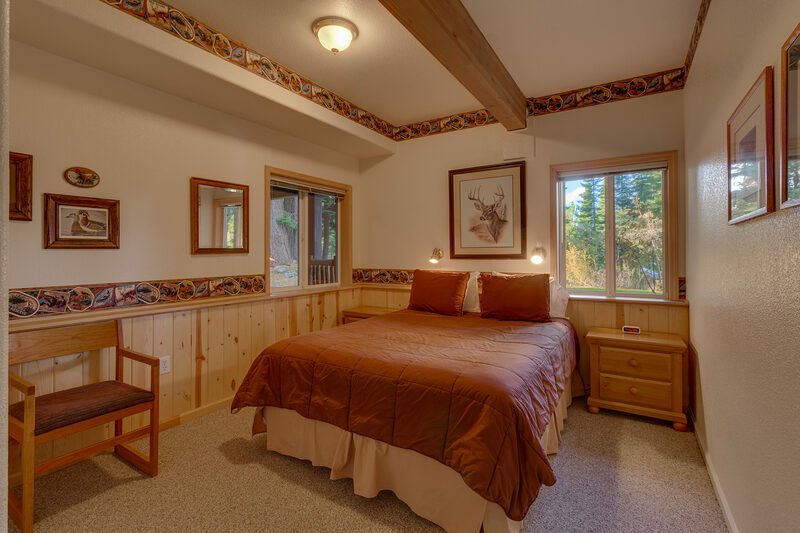 We had a wonderful experience with First Accommodations and their ref-nest property. 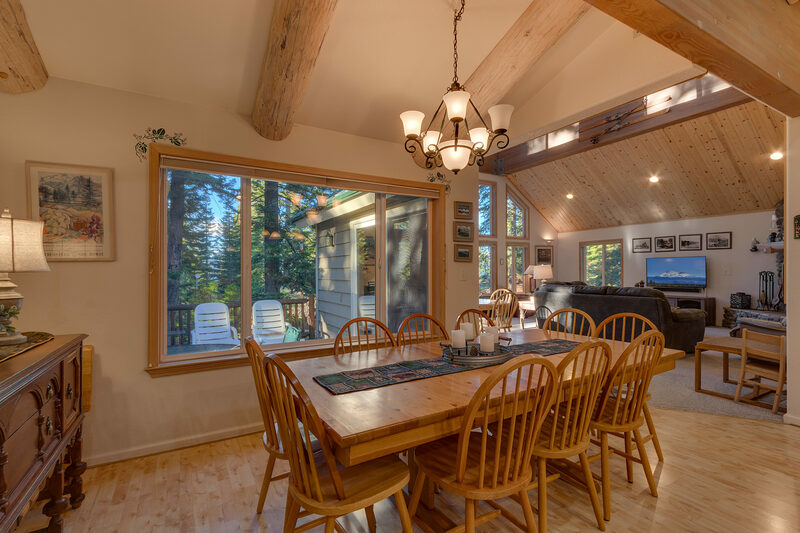 The house is great for large groups, plenty of beds and space for kids, and wonderfully stocked for large group dinners. They were even able to extend our reservation a night when the I-80 closed from a storm!! 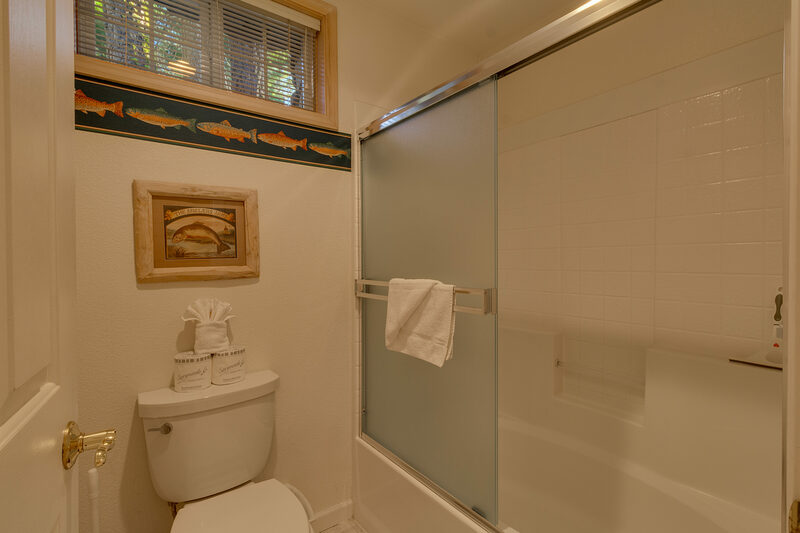 All around a great experience with this fabulous location right next to Homewood. 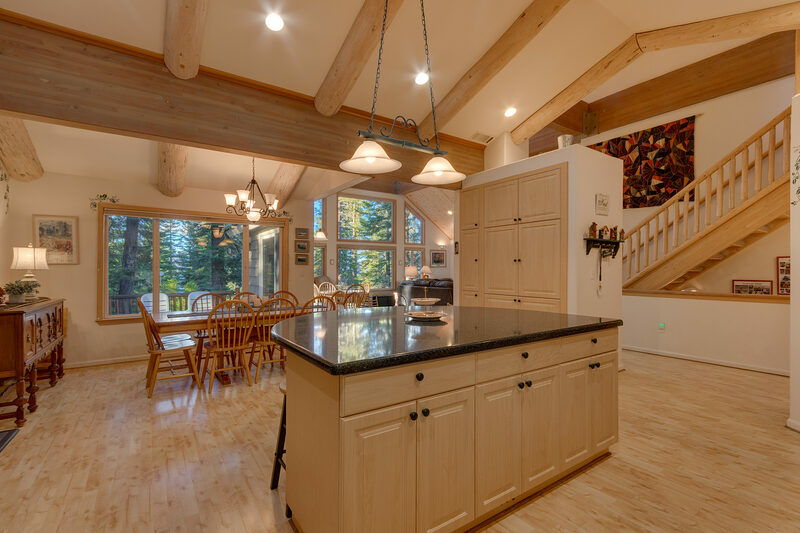 The house was perfect! 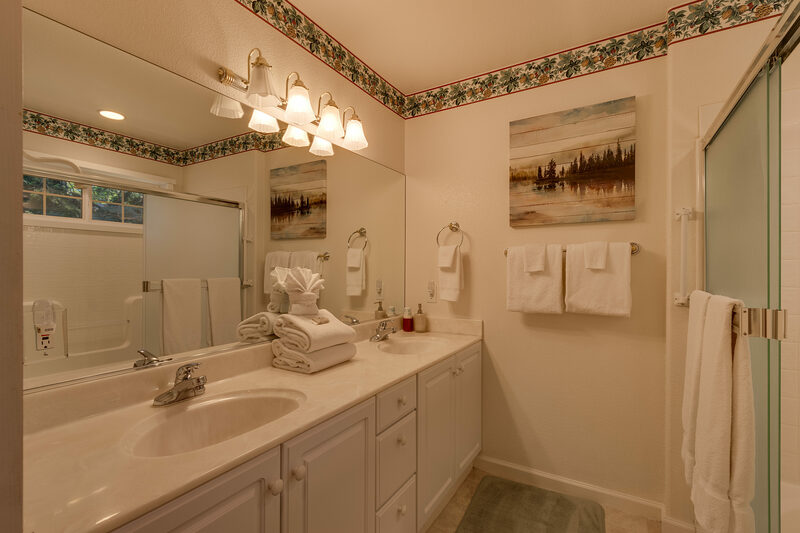 Clean and very spacious. 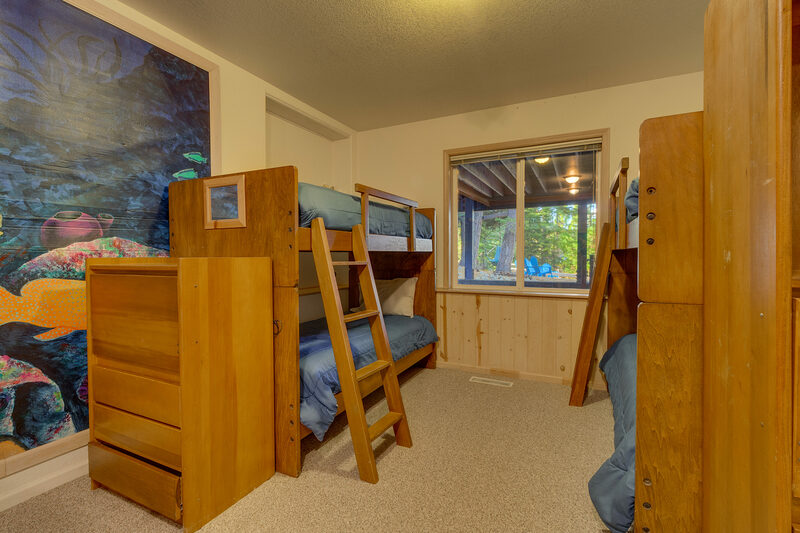 Plenty of beds and furniture for a large group. Beds were comfortable and everything was working properly. Very much enjoyed our stay. © 2019 First Accommodations All rights reserved.